Synthetic peptide, corresponding to a region within amino acids 725-775 of Human GRIP1 (NP_066973.2). 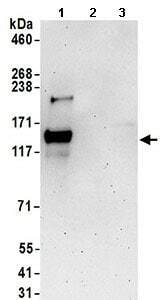 ab168848 was affinity purified using an epitope specific to GRIP1 immobilized on solid support. Our Abpromise guarantee covers the use of ab168848 in the following tested applications. WB 1/2000 - 1/10000. Predicted molecular weight: 122 kDa. May play a role as a localized scaffold for the assembly of a multiprotein signaling complex and as mediator of the trafficking of its binding partners at specific subcellular location in neurons. Contains 7 PDZ (DHR) domains. PDZ 6 mediates interaction with the PDZ recognition motif of EFNB1 and EPHB2 and with the C-terminus of PPFIA1 and PPFIA4. PDZ 4 and PDZ 5 mediate interaction with the C-terminus of GRIA2 and GRIA3. PDZ 4, PDZ 5 and PDZ 6 mediate homomultimers. PDZ 7 mediates interaction with PDZ domain of GRASP1. PDZ 7 domain binds CSPG4. PDZ 6 mediates interaction with the C-terminus of liprins-alpha. PDZ 1, PDZ 2 and PDZ 3 mediate interaction with the PDZ-binding motif of FRAS1 (By similarity). PDZ 4 and PDZ 5 mediate interaction with PRLHR. Cytoplasmic vesicle. Endoplasmic reticulum. Cell junction > synapse > postsynaptic cell membrane. Cytoplasmic and membrane-associated with vesicles, peri-Golgi complexes and endoplasmic reticulum. Enriched in post-synaptic plasma membrane and post-synaptic densities. Detection of GRIP1 in Immunoprecipitates of 293T whole cell lysate (1 mg for IP, 20% of IP loaded) using ab168848 at 6 µg/mg lysate for IP and at 1 µg/ml for subsequent Western blot detection. ab168848 has not yet been referenced specifically in any publications. Publishing research using ab168848? Please let us know so that we can cite the reference in this datasheet. There are currently no Customer reviews or Questions for ab168848.